MIT offers a variety of introductory mathematics courses suited to different freshmen backgrounds and preferences. The mainstream freshman math courses are Introductory Calculus (18.01), and Calculus of Several Variables (18.02). Freshmen who received a 4 or 5 on the Advanced Placement B.C. Calculus test or a 5 on the A.B. Calculus may take 18.02. Professor Victor W. Guillemin will be teaching 18.01 this year. The course, which follows the standard calculus syllabus, is recommended for students who have taken less than a full year of calculus in high school. Students who complete 18.01 have satisfied the prerequisites for 18.02 and 18.023 in the spring. The textbook is Calculus with Analytic Geometry, by Simmons. Guillemin did both his undergraduate and graduate work at Harvard University, where he received his Ph.D. in math. His specialty within mathematics is global analysis and partial differential equations, and he has been at MIT since 1968. However, he said that this year will be his first “in about 25 to 30 years” to teach 18.01. “I want to all my students to graduate with high grades,” Guillemin said. He shares the hope of all professors that his students will “skew the grade distribution by doing spectacularly well” compared to previous years. Students who have had a full year of calculus but did not receive 18.01 credit or do not feel adequately prepared to take 18.02 may opt to take 18.01A-18.02A sequence instead. For the first half of the term, students review 18.01 material. Students then start 18.02 material, which they may choose to complete in the January Independent Activities Period or in the spring term. The textbook for the course is the same one used in 18.01, Calculus with Analytic Geometry, by Simmons. Professor David S. Jerison is teaching the 18.01A-18.02A sequence this fall. He did his undergraduate work at Harvard and received a Ph.D. in math from Princeton University. He has been at MIT since 1981, and his specialization is partial differential equations and fourier analysis. Jerison said that in the future the 18.01A-18.02A sequence will be ideal for the student who passed the A.B. Calculus exam. 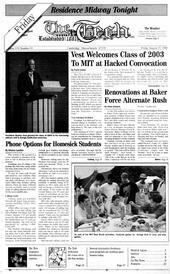 He said starting next year MIT may decide to disallow students with a 5 on the A.B. Calculus test from satisfying the 18.01 requirement. The reason for the change would be to better account for the fact that the A.B. high school curriculum typically covers only 2/3 of the B.C. Calculus curriculum. Currently, “if you don’t know half the A.B. curriculum, you’ll be lost,” Jerison said. He said that ever year there a few people who, despite being qualified for 18.02, find themselves “teetering on the edge” and behind when taking 18.02; for those students, he said that 18.01A-18.02A may be a better option. “MIT is a very exciting place,” Jerison said, when asked for the reason he chose to come to MIT. He said that he enjoys the interaction between the disciplines of science, engineering, and mathematics here. Students with a deep yearning for the theoretical side of mathematics with all the proofs spelled out should take Calculus with Theory (18.014). Students who complete 18.014 can take 18.024 in the spring, the theoretical version of 18.02. The textbook for the course is Calculus I and II, by Apostol. The 18.014-18.024 sequence typically falls under the title “Honors Calculus” at other universities. Professor James P. Munkres returns as lecturer of 18.014 from last fall. He attended Nebraska Wesleyan University for his undergraduate work and went to the University of Michigan for his graduate work. He taught at the University of Michigan and at Princeton before coming to MIT. His specialization is topology, the study of the geometric properties of objects that remain constant in space even when they are wildly distorted. Munkres studied the piano since he was five, and he said he chose math over music because, “If worse came to worse, I would rather teach high school students algebra than little kids piano.” Munkres continues to play at the annual math department recital, and he also enjoys gardening and hiking. 18.02 is the mainstream multivariable mathematics course. Students who received a 4 or 5 on the Advanced Placement B.C. Calculus test or a 5 on the A.B. test can take 18.02. Professor Arthur P. Mattuck is teaching the course, and the textbook is Multivariable Calculus with Analytic Geometry, by Edwards and Penney. This fall’s 18.02 course is the same as last fall’s 18.02C course, which Mattuck taught as well. Last fall’s 18.02 course is called 18.022 this fall, and it is taught by Professor Hartley Rogers. The change in the numbering was done to make the fall 18.02 course similar to the spring 18.02 course, Mattuck said. Just as in last year’s 18.02C, students will be using mathematical software such as Maple. Introducing such software into the curriculum at an early stage is important for freshmen who later pursue more engineering-intensive subjects, Mattuck said. “Work hard,” Mattuck advised. Like most professors, he said that doing the problem sets was essential for understanding the material. “[Students] always complain that problem sets are a lot harder than exams,” Mattuck said, “but exams are only superficial,” and problem sets are the ideal way for learning the material. Mattuck went to Swarthmore College for his undergraduate years and did graduate work at Harvard in algebraic geometry, which is his specialty. He has been at MIT for about 40 years. Last year’s 18.02 is this year’s 18.022. Professor Hartley P. Rogers is teaching the course. 18.022 is for students interested in a more theoretical approach to 18.02-type material than 18.02. The textbook, written by Rogers, is Multivariable Calculus with Vectors. Professor Harvey P. Greenspan, who is teaching 18.023 next term, has been affiliated with the course almost every year since the course was created about 20 years ago. “Too long” or “long enough” were the descriptors Greenspan used to convey the length of time he’s been here. He co-wrote the textbook, An Introduction to Applied Mathematics, with MIT Professor David J. Benney. “18.023 is an intensive course,” said Greenspan, with an emphasis on “applied methods and techniques of scientists.” Students, he said, often come in with the expectation that the course is easier than it actually is. To compensate for the intensity of the course, it is structured to make it easier on freshmen. There are four exams and no finals, Greenspan said, and “exams are largely based on problem sets,” sometimes even being directly drawn from problem sets. Like every other introductory math course, doing problem sets is the key to success. Homework will typically be five to six problems from the book three days a week. Students who don’t do the homework will find that they have to drop the course or they will fail, Greenspan said. Greenspan did his graduate work at Harvard University, and his specialty is fluid dynamics.